Cattle fed rations containing SHREDLAGE had greater final body weight, average daily gain, and efficiency than cattle fed conventionally chopped corn silage. Photo credit Brianna Conroy. Steam-flaking corn improves the utilization of the energy in corn, but can also make cattle more susceptible to digestive upset due to the rapid digestion of starch in the rumen. Larger particles of roughage might help alleviate rumen digestive disorders. Therefore, a study was conducted at the Panhandle Research and Extension Center feedlot evaluating SHREDLAGE at 26.5 mm and 1 mm gap SHREDLAGE processor, processed by CLAAS, to conventional chopped corn silage at 13 mm with a standard CLAAS processor set to 1 mm, as a roughage source at two levels to cattle fed steam-flaked corn based finishing diets. Final finishing diets contained 9 or 14% corn SHREDLAGE or conventionally chopped corn silage in a factorial treatment arrangement. Diets also contained 15% wet distillers grains and 5% mineral supplement on a dry matter basis. The remainder of the diet dry matter came from steam-flaked corn. The cattle were fed 128 days. Cattle fed rations containing SHREDLAGE had greater final body weight, average daily gain, and efficiency (P < 0.05) than cattle fed conventionally chopped corn silage (Table 1). There was a tendency for the 9% roughage inclusion to improve final body weight (P = 0.06) and average daily gain (P = 0.09) while feed efficiency was improved (P =.04) (Table1). Feeding SHREDLAGE and reducing the amount of roughage fed resulted in improved hot carcass weight, daily gain, and efficiency (Table 2). 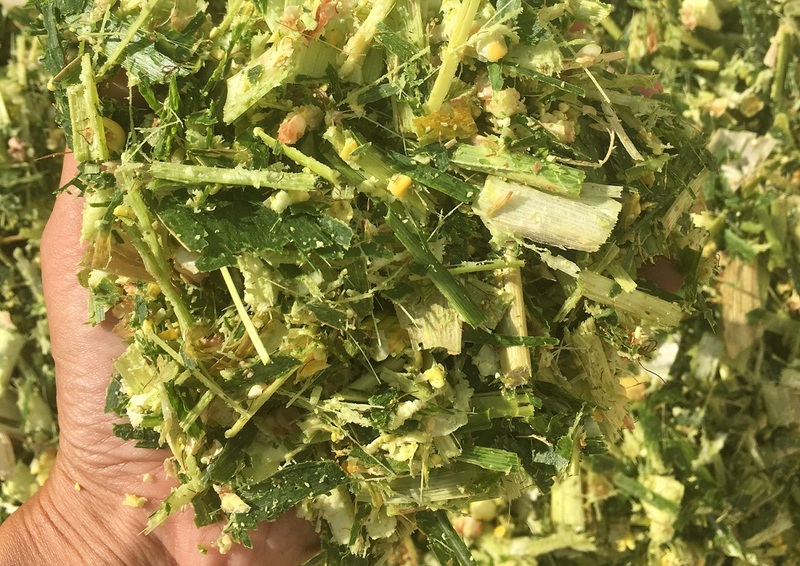 These results suggest that a procedure that shreds silage, leaving larger particles, as opposed to conventional chopping can be fed at a minimal level in the diet and result in improved performance over traditionally harvested corn silage.